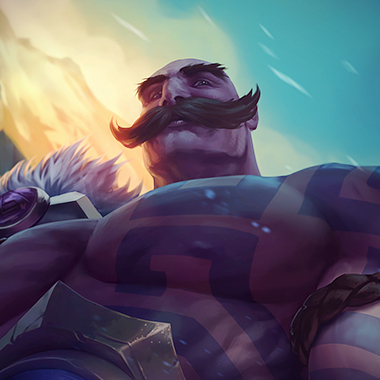 Braum is a tanky support that comes full of peel and CC for priority targets. He's unique in the way that he can literally defend another champion by taking damage for them and stopping the damage at him, while reducing it. This is coupled with his passive that gives his teammates the chance to stun targets, and one can see why he's a consistently strong support and reasonably difficult to play against. 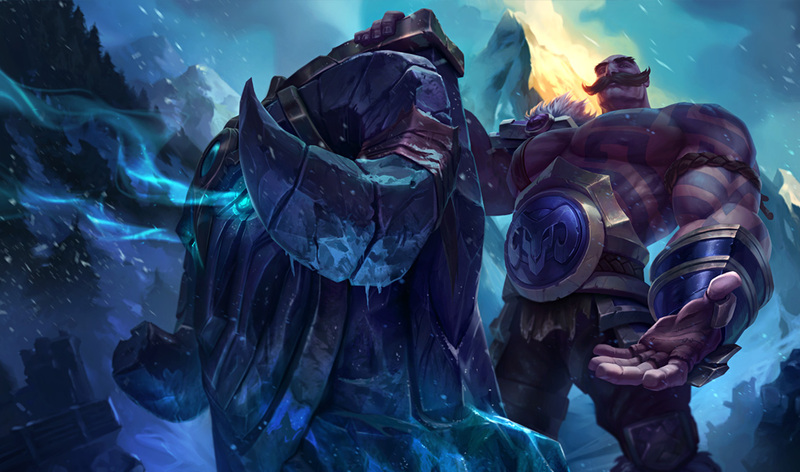 Braum's basic attacks and Winter's Bite each apply Concussive Blows to his target for 4 seconds, stacking up to 4 times. Once the first stack has been applied, any allied champion's basic attack on the target generates an additional stack. This effect cannot occur on the same target more than once every few seconds, but during this immunity period affected targets instead take bonus magic damage from Braum's basic attacks and Winter's Bite. Braum dashes to the target ally, positioning himself between them and the closest enemy champion, gaining bonus armor and bonus magic resistance for 3 seconds. If his target is a champion, they also receive the same bonuses. 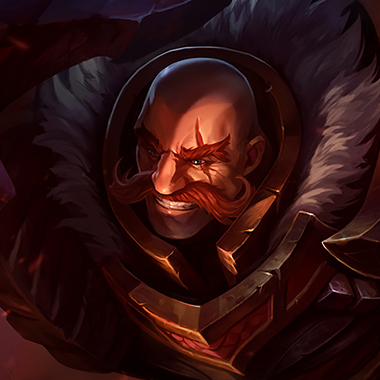 Braum raises his shield in the target direction, creating a barrier that intercepts incoming non-turret enemy projectiles and reduces the damage he takes through the shield. The first instance of damage blocked by his shield is negated completely. While his shield is raised, Braum also gains 10% bonus movement speed and is Ghost ghosted. 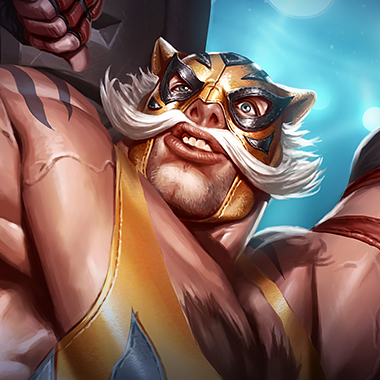 Braum leaps into the air and slams his shield into the ground, creating a fissure in the target direction that deals magic damage to enemies as well as those around him. Enemy champions hit in the close vicinity are knocked up for 1.5 seconds, while enemies hit in the line are knocked up for 0.25 seconds. If no enemy champions are hit in the point-blank area, the first enemy champion hit in the line is knocked up for the full duration. A field of ice then remains at the fissure's location for 4 seconds, slowing enemies within. Both Braum and anyone he's trying to protect are significantly less protected while Unbreakable is on cooldown, and it's lowest cooldown (Without CDR) is 10 seconds, meaning that there is an ample window on which to make a move onto Braum or his team. Keep minions between you and Braum. It'll force him to have to walk up onto you to land his Winters Bite, and walking into someones minion wave is an easy way to end up staring at Grey Screen. Hold your long range ultimates for a little while after beating Braums team in a fight, shooting them a few seconds late can easily net you a kill if life bars are blinking, but if you shoot them too fast, you risk having them blocked with Unbreakable. 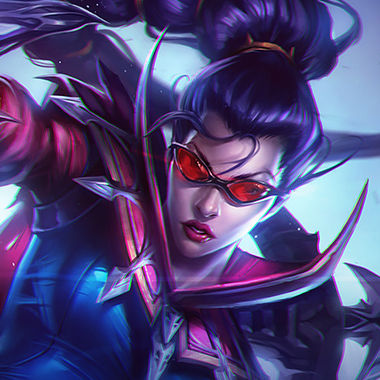 Braum can't reduce true damage, and Vayne can't stop dealing true damage, not that she'd want to stop. She also reaches the point where she can just walk around and three shot things, and if he tries some sort of engage she can condemn him away. Note that he will still have pressure on Vayne very early on. 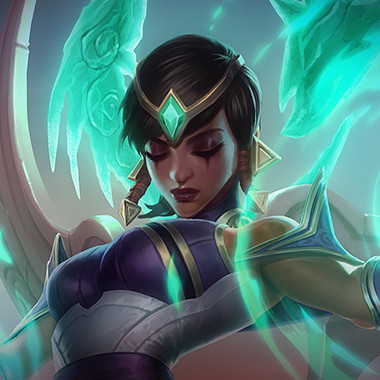 He can't block and dodge every Karma Q, she falls in the category of champions that "Deal damage more often than he can throw his shield up" not to mention the safety she can bring her AD Carry with a speed boost and shield, if Braum should try and go aggressive on her or her Carry, she can simply walk away. 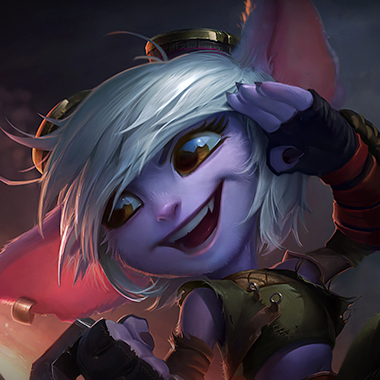 Scaling AA range, a good escape and a way to knockback Braum if he should try to engage makes Tristana a good pick into him. Not to mention, that in lane she can jump behind Braums shield to finish off a low health AD Carry, circumventing one of his strongest points early. 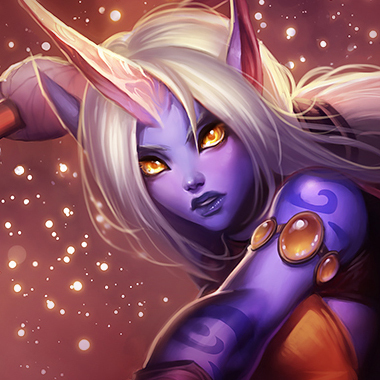 Soraka gets around Braums strong defenses and peel by never fighting him ever. She doesn't ever have to do anything, and the lane will be ridiculously passive the only chance Braum has is if he something like a Draven and they can kill Soraka before level four, and even then, that would take some serious mispositioning on Raka's side. Braum doesn't do much damage as the game progresses, so it's better to just move on to the utility used to counter his CC. QSS, Merc Scimitar and Mikaels can save lives if used at the correct time. A Banshees Veil is worth building since it can save you from being picked off thanks to his CC, if you're out of position.